But this is a dangerous situation for trees and shrubs laden with snow as the sun hits them and makes them incredibly heavy. Brittle or frozen branches run the risk of snapping. This can cause an enormous amount of damage. I hate to much this up because the garden just makes my heart fill up when it this serene. Very hard not to spend a lot of time gazing at it and ignoring the situation as it actually is. So out I went and trammelled up the untrammelled. Things here are a bit nasty. My adored husband, Jack, has to have heart surgery and I haven’t felt like blogging or doing anything but spend time thinking about him (and being with him). We don’t know when the tests will begin and we don’t know when the surgery will take place, so it’s a waiting game at the moment. It’s hard to feel like going out and being social. So once again the garden is a solace. This fact has kept me going through a lot of crises. Something smashes you in the face, you spend time in or looking at the garden and you can feel the beat of your heart change. You can feel the calm entering your body. The garden does heal but of course you have to let it do its work. I can’t imagine being without a garden whether it’s what I see behind my house or having plants in pots to gaze at. Speaking of plants to look at. The Amaryllis from Gardenimport are all coming into bloom and they are gorgeous. This is truly looking into the face of nature. All those complex little details and the subtle striations of colour. I’d love to post a picture, but my brand new camera doesn’t work properly. So another schlep to the camera store. I was banging away with it over Christmas and anything took was not properly in focus. Not good. Lovely shot and sentiments. I adore Winter, although towards the end I tend to long for Spring. Not there yet, my posts are still relishing the scenes of Winter. I can imagine how worried you must be about your husband Jack. My own husband is diabetic. He had a stint put in his heart to clear a blockage of the arteries when he was in his early forties. We spent days and days in the hospital, with my husband under constant watch for a possible heart attack, while we waited in the lineup for surgery. The operation itself took 30 minutes. I send my best wishes for Jack’s speedy recovery. Dear Marjorie, my heart goes out to you and your beloved Jack. Take the time to be with him and don’t worry about the rest. 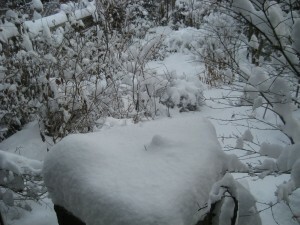 May your beautiful winter garden be a solace for you both. All the best. For us snow is not here yet, maybe another month until we see any. Thank you for this. It’s hard beating back being depressed. This waiting is really debilitating. But we’re attempting to be normal.